Reverse PAMP Suisse One Ounce Palladium 9995, and the serial number. PAMP Suisse One Ounce Palladium 9995, and the serial number. 1 oz PAMP Suisse Palladium Bar This PAMP Suisse Palladium bar features the Roman goddess of fortune. The obverse depicts a blindfolded Lady Fortuna (from the Latin fortuna, -ae f fortune or luck) with a cornucopia or "horn of plenty". This is the positive aspect of luck or rather good luck. The Certicard lists the the weight, purity and serial number, along with the signature of the chief assayer and contact info for PAMP Suisse. 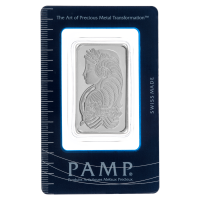 PAMP is an acronym for Produits Artistiques Métaux Précieux or artistic precious metals products and is a world renowned refiner specializing in precious metals for artistic use. These bars are manufactured to the highest standards by one of the biggest names in Swiss refined precious metals. PAMP Suisse is one of the leading names in precious metal products, making this a great way to invest in palladium.